Emirates, the world’s largest operator of the U.S. -built Boeing 777, celebrated the fleet completing over 859,000 flights while logging over 4,720,000 flight hours since its first delivery in 1996. On 3 September, the airline and Boeing marked the 150th Emirates 777 delivery milestone, with a triple delivery of two Boeing 777-300ERs and one Boeing 777 Freighter. Emirates’ 147-strong Boeing 777 fleet criss-crosses the globe, currently serving 98 destinations on six continents. These staggering operating milestones underscores Emirates’ long-term commitment to the Boeing 777 program and its contribution to aerospace manufacturing and related jobs in the U.S.
“Emirates’ approach to global air travel has created substantial additional demand for U.S.-made aircraft and engines, and benefited millions of travellers,” said Sir Tim Clark, President Emirates Airline. Emirates’ multi-billion dollar investment in the Boeing 777 program over the past 19 years, with committed deliveries for the next decade, continue to support jobs and innovation in the US aerospace manufacturing supply chain. Including its record-setting order in November 2013 for 150 GE-powered Boeing 777Xs, Emirates currently has an order book of 196 Boeing 777s valued at US$93 billion at list prices. The US Department of Commerce estimates that 5,359 U.S. jobs are created for every one billion dollars in value of U.S. export goods. On this basis, Emirates’ bulk order of the Boeing 777s alone supports over 400,000 new American jobs. With its launch of daily services to Orlando, Florida on 1 September, Emirates now serves 10 U.S. gateways, providing international connections for business and leisure travellers into these airports and their surrounding regions/economies. In an analysis by aviation experts Campbell-Hill Aviation Group, it has been demonstrated that Emirates supports 3,975 U.S. jobs with each of its U.S. daily flights, and the employees holding these jobs earn $161 million per year 1. 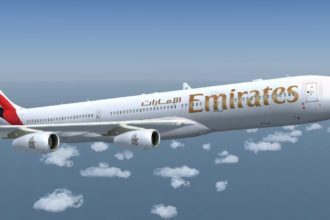 The Greater Orlando Aviation Authority has noted that Emirates’ new daily Orlando-Dubai non-stop flight, using the Boeing 777-200LR aircraft, will generate more than $100 million in new annual economic activity and support nearly 1,500 jobs. Furthermore, Emirates’ operations bring an estimated total of $2.9 billion in economic value to New York, Dallas/Fort Worth, Houston, Los Angeles, Boston, San Francisco, Seattle, Chicago and Orlando airports and surrounding areas according to economic impact studies from these respective airports and regions. Emirates also helps support the U.S. export market, with its growing network connecting more of the USA to key markets in the Middle East, Africa, and Asia. During Emirates’ most recently completed fiscal year (April 1, 2014 to March 31 2015), Emirates carried 120,320 tonnes of cargo from the U.S. to different parts of the world. As of May 2015, Emirates had already transported more than 27,900 tonnes of cargo. Emirates’ Boeing 777 fleet has been instrumental in helping to transport this cargo, not only through its belly-hold capacity on passenger flights, but also via dedicated freighter services. The airline’s all-Boeing freighter fleet comprises thirteen Boeing 777Fs and two Boeing 747Fs.